A single snow capped peak towered towards the sky. Mount Ruapehu looked like the remains of a mountain after a serious of violent eruptions have torn its summit to pieces again and again. It’s not far from the truth. The surrounding plains appeared to be perfectly flat, lava flows from previous eruptions destroyed everything in their path. 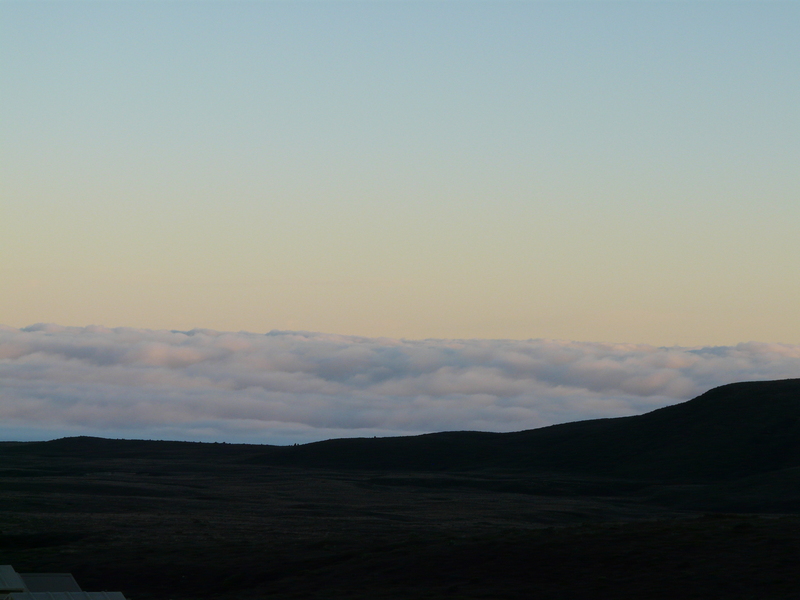 Giant, fluffy white clouds nestled peacefully in the crags of the mountain top. 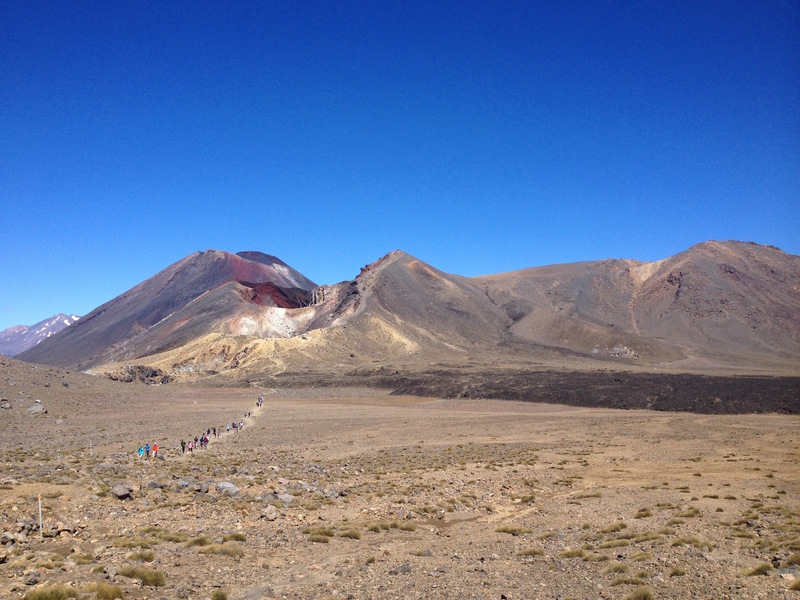 We were on our way to see the inspiration for Mount Doom, we had arrived in the Tongariro National Park. The alarm was set. A shuttle bus was due at the campsite at 6:45. This was the first bus that delivered hikers to the Mangatepopo car park to set out on the Alpine Crossing. Let’s not pretend, this is what I had been most looking forward to. According to all manner of sources the journey from start to finish would take somewhere between 6-9 hours, depending on fitness and the number of peaks attempted along the way. The fastest recorded time for crossing is just under two hours. I don’t know whether that was for fun or what but I’m not looking to break any records. If I can complete the crossing within the stated time, I’ll be happy. The coach was warm and I was immediately under the impression I had over-prepared, wearing too many layers. I started thinking I should have left my jacket behind right up until we stepped of the bus. It’s early, we’re already close to 1000 meters above sea level. The bus had driven through what looked like thick fog until we’d pulled off the main road and continued climbing. Stepping out into the fresh blue sky and crisp mountain air, I was relieved I’d stuck with the jacket. Looking back the way we’d driven in was an ocean of cloud. We were four of hundreds of people already marching ahead on the well formed, distinct track weaving up towards the mountains. The first section was an easy ascent, slowly climbing towards the Soda Springs. Mum, Dad, Lisa and I all agreed to walk at our own pace. We’d meet each other at the finish line. We began fairly close together, Mum and I stopped regularly to take photos every hundred meters or so. The first 5km were easy, a gentle stroll uphill to the last toilet this side of the mountain. I found myself there first and decided to take the 10 minute detour out to the source of the Soda Springs. I followed a trickling stream through patches of dried out orange algae when the first wave of sulphur hits me. It’s like a big dirty fart that you’re secretly proud of but would never admit to. The springs emerge behid a cliff, a small waterfall dribbles down. I trekked back to the toilets and consider again the cause of the smell. Mum and Dad had just arrived, Lisa’s marched on. The next section was the Devil’s Staircase. There’s no escaping the steep, never ending ascent. I was grateful for the sections that had been cut into steps to make the going a little easier, at least I assumed they made it easier. The views back across the valley made make regular breaks a forgivable choice. I passed Lisa about half way up, by this point even the stairs had become a punishment. My thighs already felt as though they were forged in the Cracks of Doom. How long will it take for them to turn to jelly? All of the walks I’ve done up until now come back to me, again, I wondered if I was fit enough to do this? The up hill struggle doesn’t come to an end. Crowds of people spread across the broad expanses of old and new lava that appear along the climb. I try not to stop so often, wanting to make it up to the South Crater before my legs quit on me. Looking back, the Devil’s Staircase appeared to be a trail of insects. Tiny figures following one another as they gradually scaled the crater edge. Making it to the top felt good, really good. The view over the national park was a fantastic reward. Way off on the horizon another volcano, Mt Taranaki, broke through the clouds. I didnt’t feel too bad, I could do this after all! 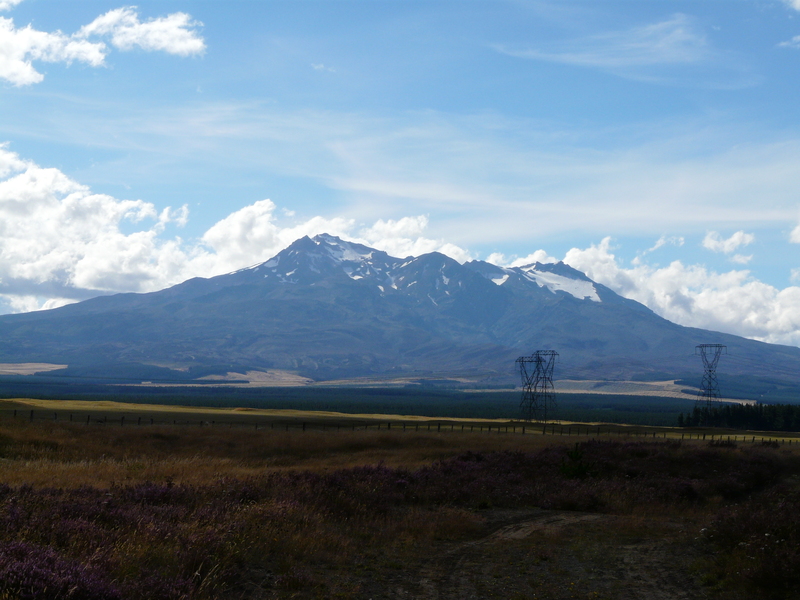 Mt Ngauruhoe, the volcano used to represent Mount Doom, can be tackled from here, I might have had time to do it. I was tempted, really tempted. It’d be one hell of a view but I’m carrying too many doubts to follow in the footsteps of Frodo and Sam. It’s supposedly a three hour return scrambling on your hands and knees like a nasty little hobbit. I might have made it up, but would I have been able to continue onwards with the rest of the crossing? I decided I would let evil be victorious and headed into the Southern Crater. The Southern Crater was a blissful flat plain which provided me with a much needed break following the Devil’s Staircase and what was to come. Mt Tongariro surrounds me on all sides, the mountains of my mind all have distinguished peaks but Tongariro is less obvious. There are at least three confirmed craters I would walk through, some people even argue Mt Ngauruhoe is another cone of the same volcano. I saw a sudden change in direction coming up. 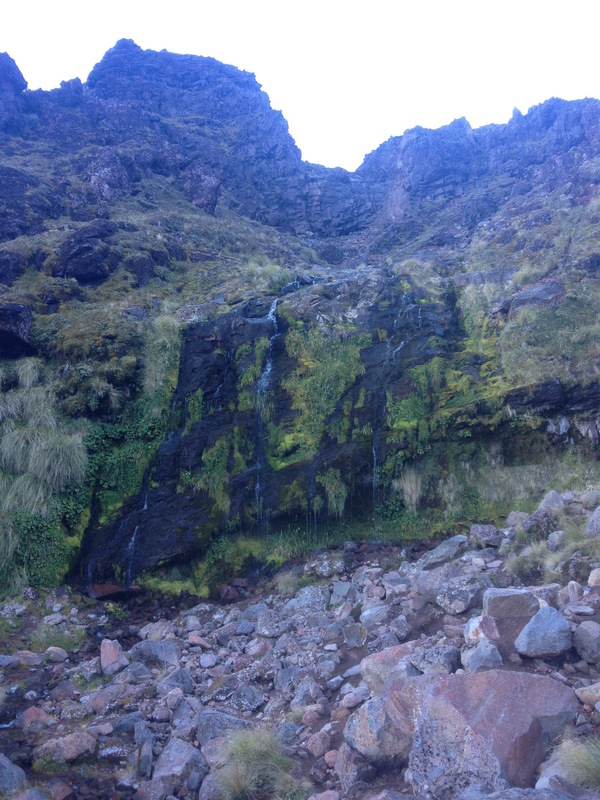 The immediate rise of the crater wall I had to climb to reach the next stage. It was an exposed ridge line, steep cliffs fell away, loose volcanic rock underfoot, the wind buffets you from both sides. Again, I found myself thankful for bringing my jacket. My legs tightened up again, I’m not even halfway there. The climb was tough, no doubt the hardest part of the crossing. A chain and cable appeared, fastened to a rocky outcrop offering shelter from the wind but you physically have to haul yourself up. 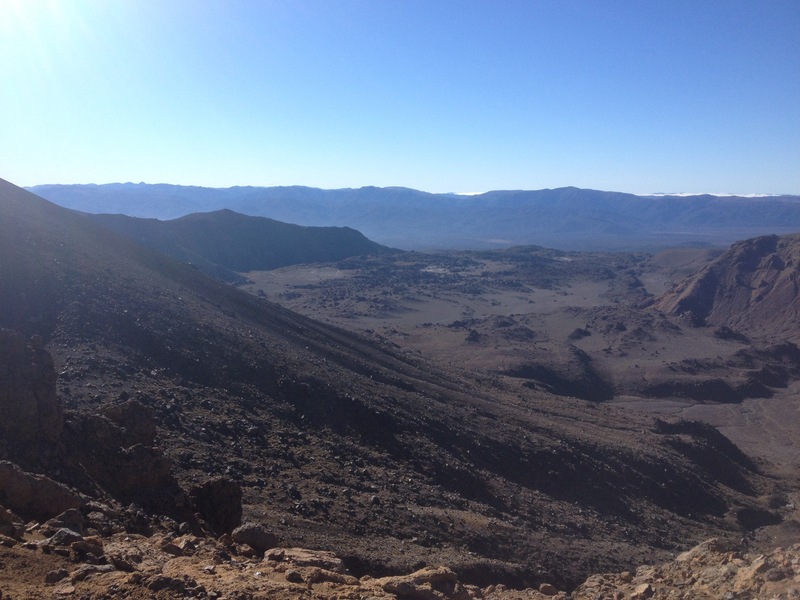 I was filled with a mixture of relief and delight on reaching another plateau before the Red Crater. There were a few groups of people huddling around like small penguin colonies, sheltering one another from the wind, preparing themselves for the next leg. I checked the time, well ahead of schedule. 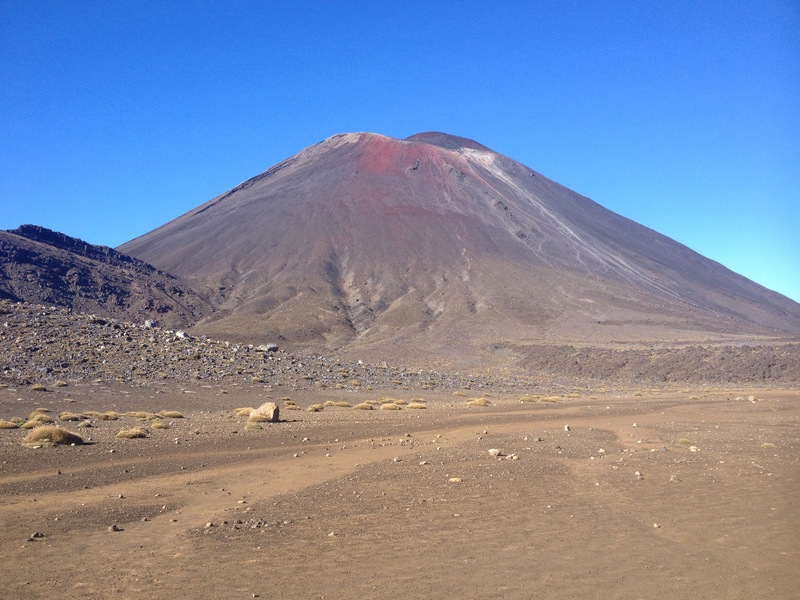 I had time to take in the Tongariro summit. The track led away to the left, there were few people heading that way. I decided to go for it, if nothing else I’d escape the hordes of hikers climbing up behind me. It’s an hour and twenty minutes or so, I figured if I timed it right I might even run into Mum, Dad and Lisa on my way back. Maybe we could complete the descent together. 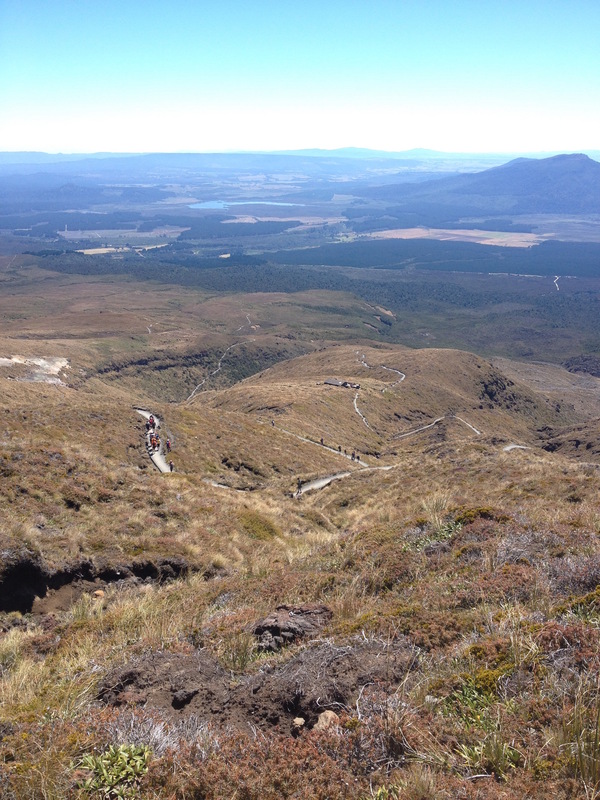 The summit track is what I imagine following the ridge of a sand dune in a desert to be like. It twists and turns like a river, one side flows down into the Southern Crater, the other rises and falls gradually descending almost 2km to the base of the plains below. The dusty browns and yellows are martian, I wondered if early episodes of Star Trek had been filmed here? The view was breath-taking. I could see the Blue Lake seemingly miles away off behind me. Every part of me enjoyed being up there, on top of the world. A smile spread across my whole face. I should do this more often. 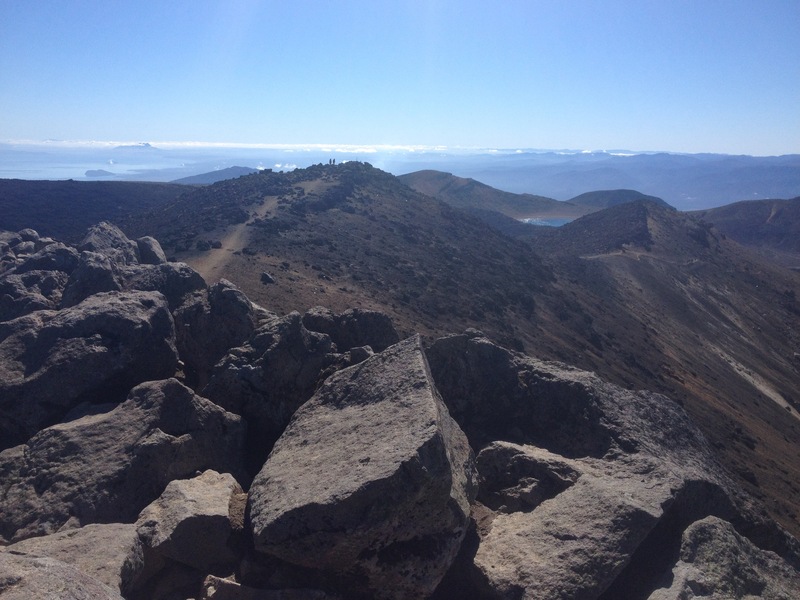 As I reached the summit the few people already there were turning back, I had the place to myself. 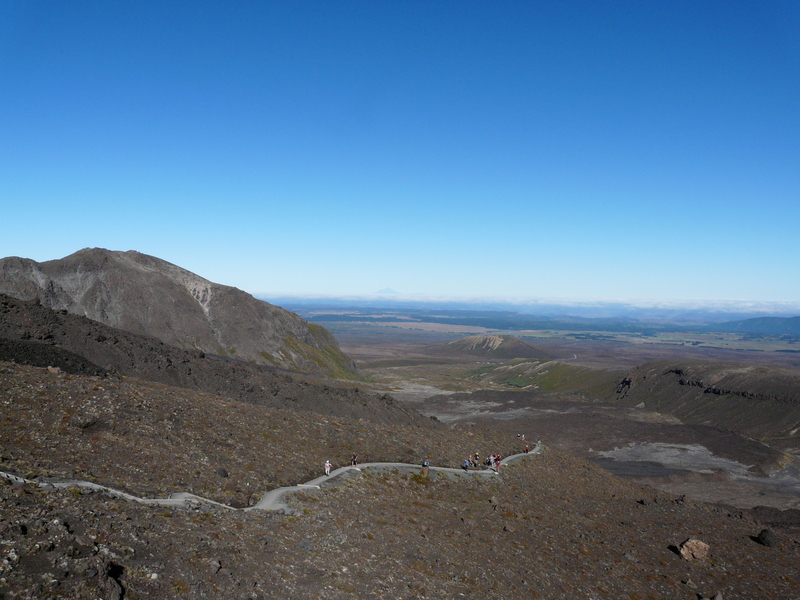 I scurried up the last rock face to the final post that marks the top of Mt Tongariro. I’d made it! I sat at the top of the mountain alone, if only for a few minutes. I could see a few more people on the trail heading towards me. I felt a sense of accomplishment wash over me in an awesome wave. I had reached the highest point of the Alpine Crossing, at least the highest point I had challenged myself to reach. It was all downhill from here, theoretically speaking anyway. Were it not for the unstable conditions underfoot and the ever increasing number of people around me I may well have skipped the whole way back to the plateau. As I approached the ridge climb I scoured the crowd for my family, wondering if they’d made it this far yet. I spotted a white shirt and an akubra, it must be Lisa and Dad but where’s Mum? I hoped she hadn’t turned back. As I got closer they emerged from the shadows, it’s not an akubra just a baseball cap. It can’t be them. I kept looking, oblivious to the waving arms of Mum and Dad in front of me. Yes! They’d made it and were both smiling. I headed straight for them and give Mum a big hug and shake Dad’s hand. Congratulations are in order. It’s no easy hike and as people in the age bracket of 50 plus I don’t know if I’ve ever been more proud of them. We sat and ate lunch together, assuming that Lisa must be some way ahead of us by now as I hadn’t passed her on my side trip. 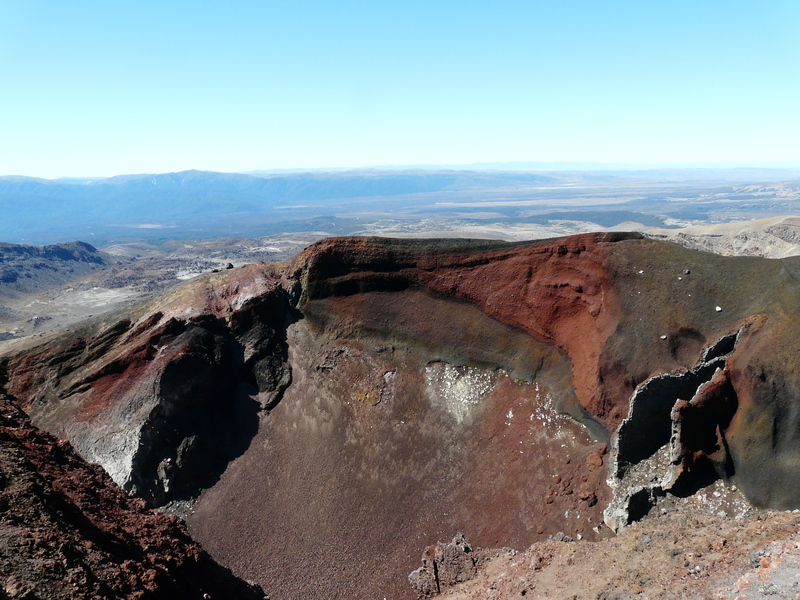 There’s a final climb up to the rim of the Red Crater but it hardly compared to the previous ascents. 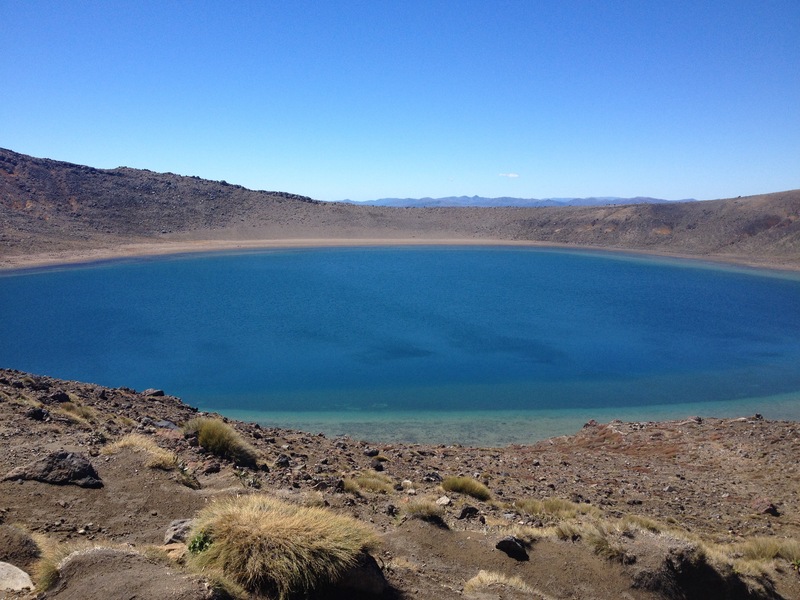 A deep red soil clung to the top, showering down like powdered snow to the emerald lakes in the crater below. 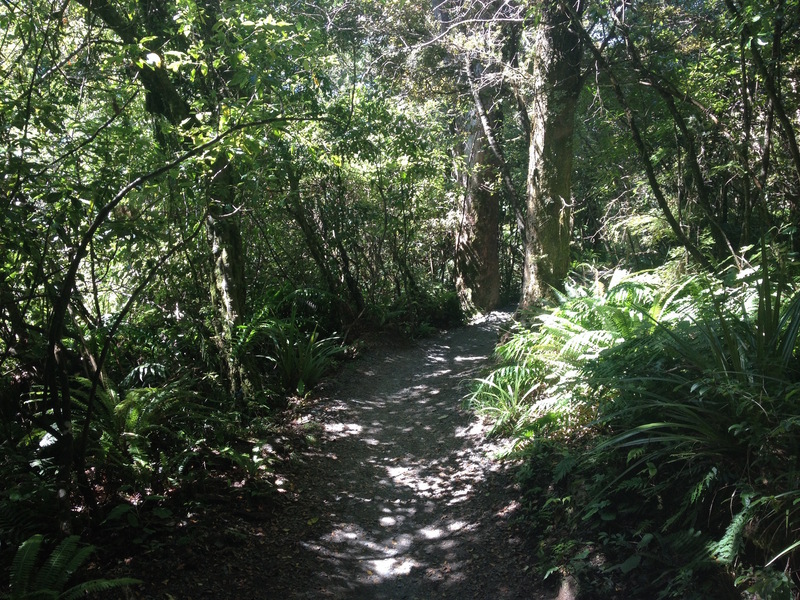 Now it really is a downhill journey, the path is a sandy, steep, downhill scramble. Loose rock and dust underfoot makes it arguably more challenging than going up. People slip and slide, it’s difficult to navigate the bodies. I fell into the footsteps of a man who seemed to know what’s up. He’s sliding with each foot racing left and right, coming down quickly and keeping mostly out of the way. The rubble tumbles away on either side of the path. You don’t want to put a foot out, it’s going to be a long walk back to the top if you do. 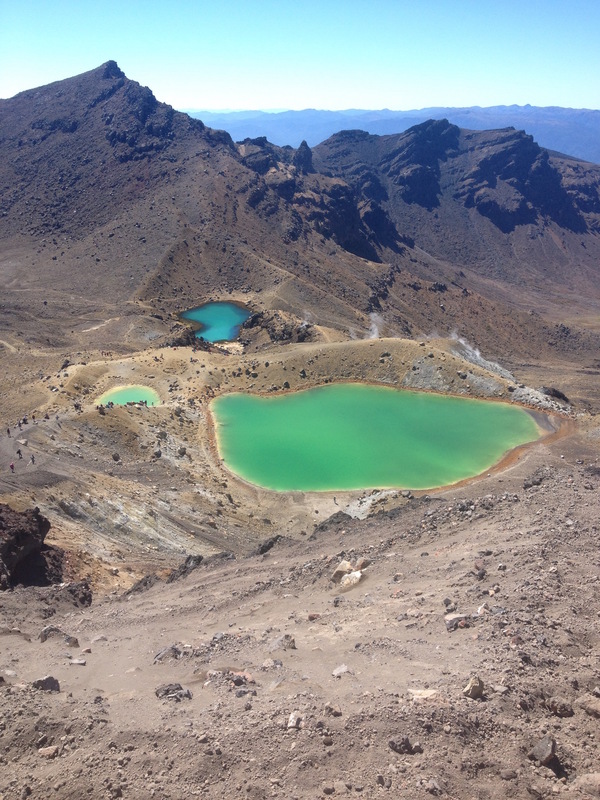 The way down provided me with a spectacular view of the emerald lakes in the craters below. Steam rose, hissing out of cracks in the scorched earth, the air is thick with the smell of rotten eggs. This is most definitely an area of volcanic activity. Along the way there have been numerous signs advising if lights flashing to return the way you came, by this point I figure if there’s an eruption I’m done. There’s no way out from here that doesn’t drop you in to the middle of another dormant crater. 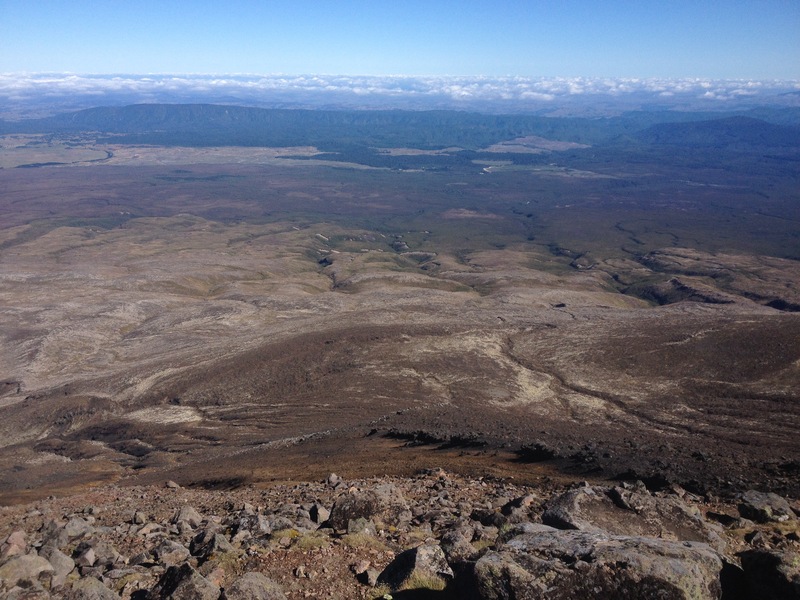 The next leg of the crossing was another relatively flat lava plain of the Central Crater. Looking back towards the mighty peaks of Tongariro and Ngauruhoe I found it hard to believe how much ground I’d already covered. How easy it is to continue walking, never stopping to look back at what’s behind you. The dusty yellow path runs almost straight, the mottled black surface of an old lava flow fills half of the crater. Ants march across the flat ground until they’re big enough to be humans. Ahead of me the track began to climb once more, I wasn’t sure how many more times I’d be able to encourage my legs to carry me further. 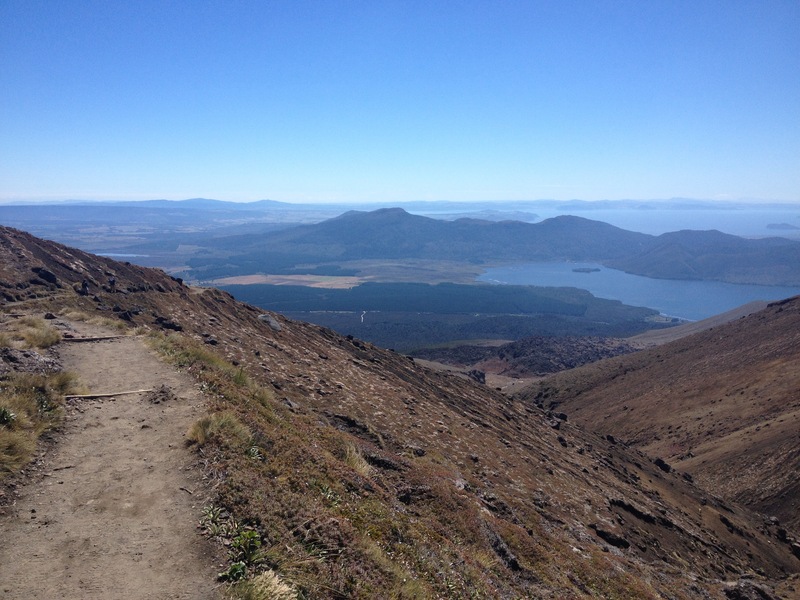 I pressed on, arriving at the Blue Lake I’d seen from the summit of Mount Tongariro. The heat of the sun was beating down, I’d been walking for hours. The water looked cool, calm and inviting. I’m no fool, I’ve seen Dante’s Peak. There’s a good reason that you’re not allowed to swim in the lakes up in the volcano, it’s one of those few places where everyone understands why getting wet would be less than ideal. Not a single person disobeys. I don’t know if my skin would have melted off or burned in the acidic liquid, I certainly wasn’t about to find out. 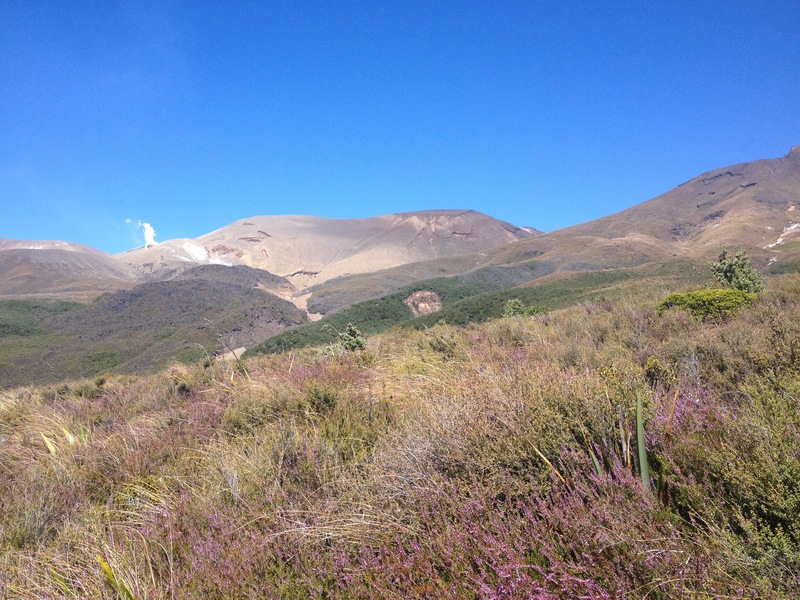 It’s a short walk out of the crater, out of all the craters and onto the towering mountainside. The walls parted to provide the most incredible view over the country to the north. Lake Taupo shimmered in the afternoon sun, a giant inland sea surrounded by rolling peaks of supposedly extinct volcanoes. I could see a white stripe that marked the drive to the finishing car park. 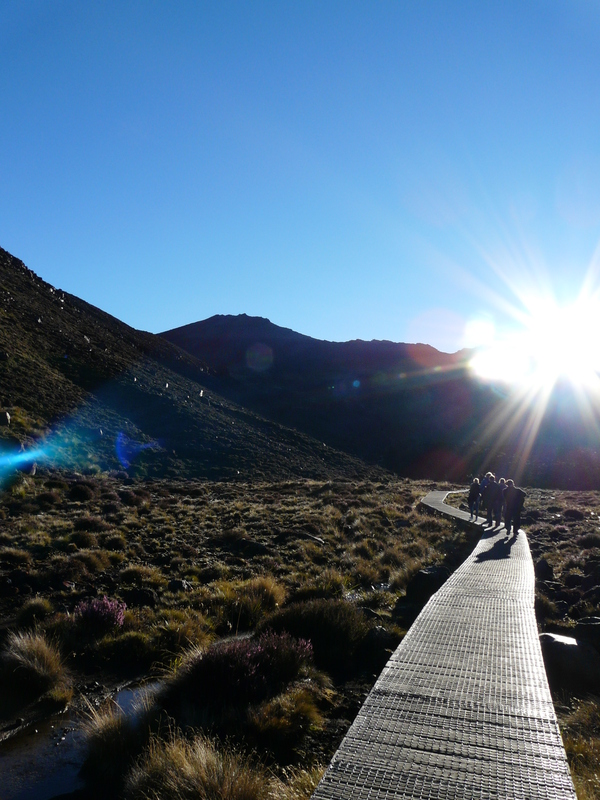 I still had some serious walking left to do, about half as far as the car park I could see the roof of the Ketetahi hut, home to the first toilets since the Soda Springs. I checked the time, wondering how far ahead Lisa was, how far behind Mum and Dad were. I was surprised not to have seen any of them again. The path was well formed, I’m relieved to again find steps cut into the rises and falls across the sprawling mounds. I’ve always found it much easier to go up than down but I stretch out my stride, slowly overtaking the people ahead of me. It’s perhaps the easiest section of the track thanks to those steps and I started to pick up speed. There’s a chance I could still finish with a good time at this rate. I drifted from left to right, snaking across the mountainside, slowly, ever slowly making my way down. I reached the Ketetahi hut to see queues spreading further downhill for the toilets. Good job I didn’t need to go. I did stop, reapplied sunscreen, tucked my jacket and jumper into my backpack to make the closing stage more comfortable. The track never ends. No matter how many times I turned a corner and walked back the way I’d come, I didn’t feel like I was making any progress. Part of the problem is being able to see the finish line, it doesn’t get any closer. The only way to feel like I’d gotten anywhere was to look back, to see the top of the crater up behind me. Fortunately the open ground was soon swallowed up by a forest. The first sign I’ve seen in a long time suggests it’s only 45 minutes to the end. Ahead of me I spot a white shirt and I’m amazed to find Lisa, I’d caught up with her at last! I briefly considered racing past to be the first one to finish but I don’t have it in me, I want to slow down. We finish the crossing together. 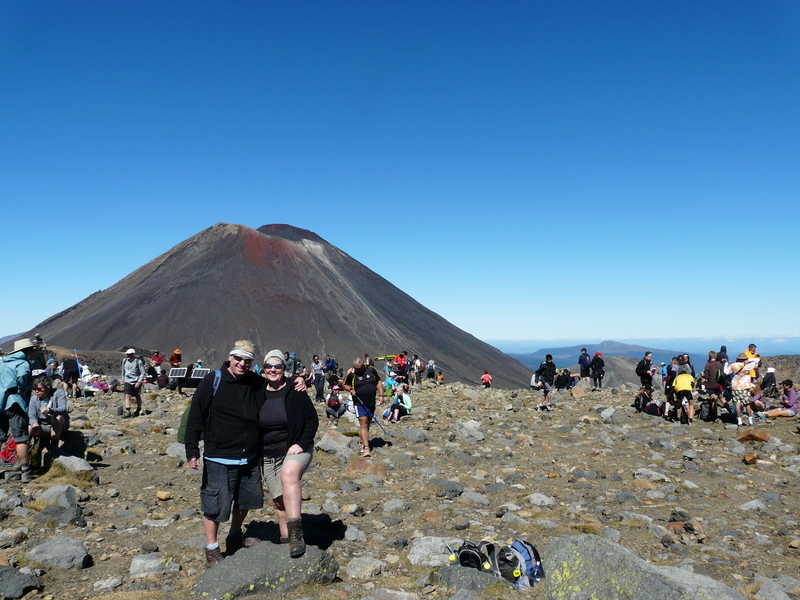 I clocked in at around 7 and a half hours including the Tongariro summit. It’s nowhere near a record time but I’m within the recommended crossing time which I’m more than happy with. My earlier concerns throughout the holiday seemed as though they were for nothing. I had made it, I didn’t have any problems, sure I was feeling close to exhausted but nothing hurts, there were no blisters, no blood. Truth be told, I was feel pretty good. Lisa and I waited in the carpark counting down the time. Mum and Dad can’t have been that far behind me, can they? The hours began to pass, the final coach departure time approached rather rapidly. I began to worry, what if Mum’s rolled an ankle? Should we go back? What happened if we missed the bus? Dad emerged from the exit alone. He was doing alright but he’d left Mum. Something must have gone wrong. Dad wasn’t sure how far behind she was, but he had to leave her to make sure we knew how far behind they were. 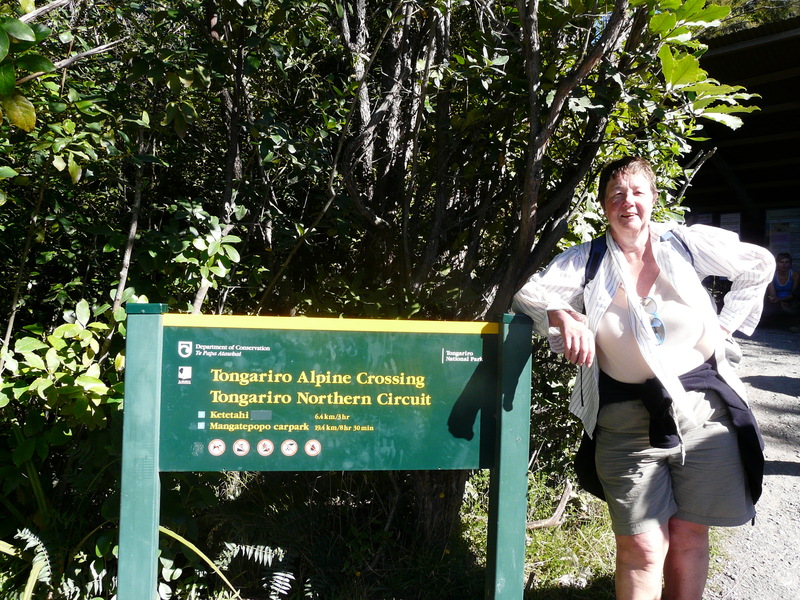 Mum had trouble with the Red Crater descent, the loose ground gave her cause for concern. After that, it was slow going the rest of the way. One of them had to get here before the last bus. Fortunately he had the keys so we agreed with Lisa to catch the last bus to the campsite and come back with the van. We timed it to perfection. Just as we pulled in to the car park Mum came out of the trees. She’d made it. 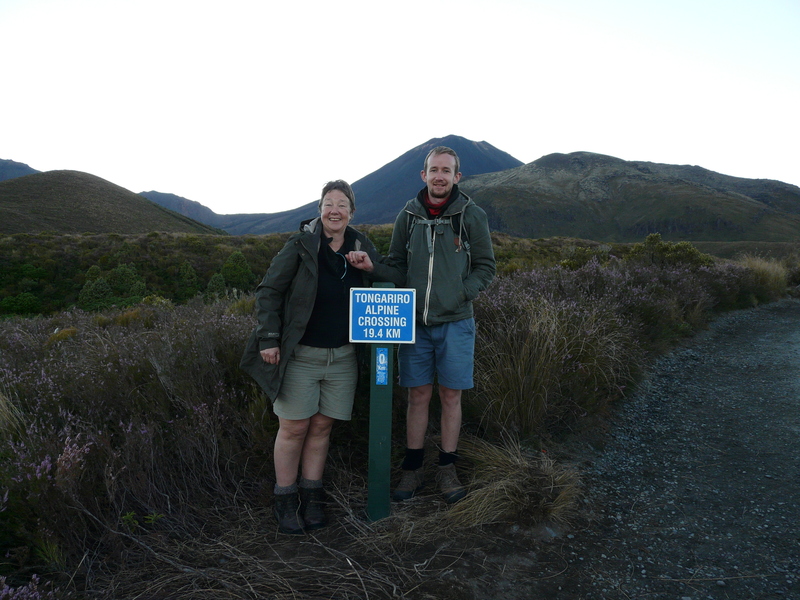 She wasn’t looking half as cheery as when I’d last seen her but she’d finished the Tongariro Alpine Crossing, we all had!